NO BULL -THIS IS TOO EASY! YOU CAN HAVE FULLY AUTOMATED MONEY GENERATING SITES THAT WORK FOR YOU 24 / 7 ! Right this minute thousands of people just like you are realizing their dreams. They dont struggle to pay their bills each month or worry about the rising cost of everything, and they dont sacrifice what they want for what they can afford because they can afford everything they want! Imagine yourself in a new car, dining in expensive restaurants whenever you want, buying expensive gifts for your friends and family, taking luxury vacations and being treated with the respect you deserve. Its a great image, isnt it? And its absolutely right in front of you! Imagine living the good life, every day, all the time, and having the time to enjoy it all. Isnt it your turn to grab a large chunk of the money pie? Would you like to gain financial freedom and personal success by building unlimited number of blogs and get them updated daily automatically and completely hands free? Of course you do! Blog Your Way to Big Bucks. You really CAN make a life-changing amount of money without even writing a single post automatically! Does this story sound familiar? You purchase book after book on how to build a Blog, or how to pursue the interests you are most passionate about, only to be left frustrated and broke. These books might give you the beginnings of what you need to know, but they fail to follow through, leaving you hanging on, and missing out, on the financial success you know is out there just waiting for you. They what your appetite, but they don't show you how to actually make money by automating your blogs. Well you're about to be delightfully surprised! This happened to me too, because I had too many projects too handle and I always wished how easy it would be too have a system run for me posting on my blogs (not a single blog) every single day, making my site look fresh with resources and virtually feeding the Search Engine Spiders. The biggest blow or revelation should I call it, came to me when one of my clients came to me and asked me why I have not update my site for months...and there I was with jars ajarred staring backat him thinking of a fast get away....in the first place I wasn't even sure that anyone will notice about the inconsistency of my blog posts...but they do! So I went a step https://www.tradebit.comking for answers on how to automate my blogs and I have even tried software programs of up to hundreds of dollars to do this, in fact I have a Script that's costing me thousands of dollars and months of development that is ongoing right at this moment of https://www.tradebit.com the whole point is that I have found free resources to do just that....AUTOMATE MY BLOGS. So does you blog update itself automatically? Do you have one at all to start with? Think about this, for a measly $27.00 today you can be on your way to having your very own high traffic, content rich web portal and making money for you in the next 72 hours! This is a small sum to pay, to start finally taking steps towards getting your automated income producing weblog online and starting to live the work at home lifestyle! 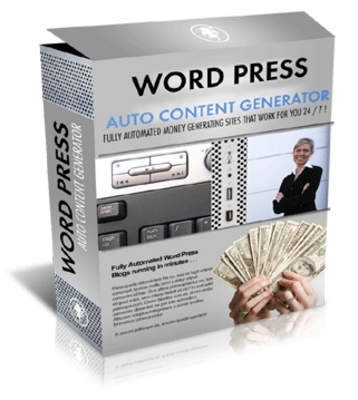 Look at it this way -- $27.00 is really a painless drop in the bucket to be able to get your hands on WP Auto Content Generator Script and start using it right away to improve your lifestyle!